wavy. 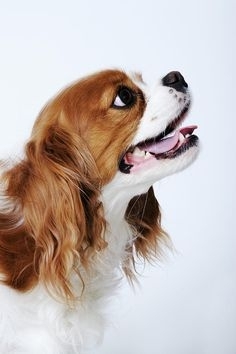 Adult Cavaliers have feathering on their ears, chest, legs, feet and tail. they love it. So be patient and be flexible with your Cavalier. 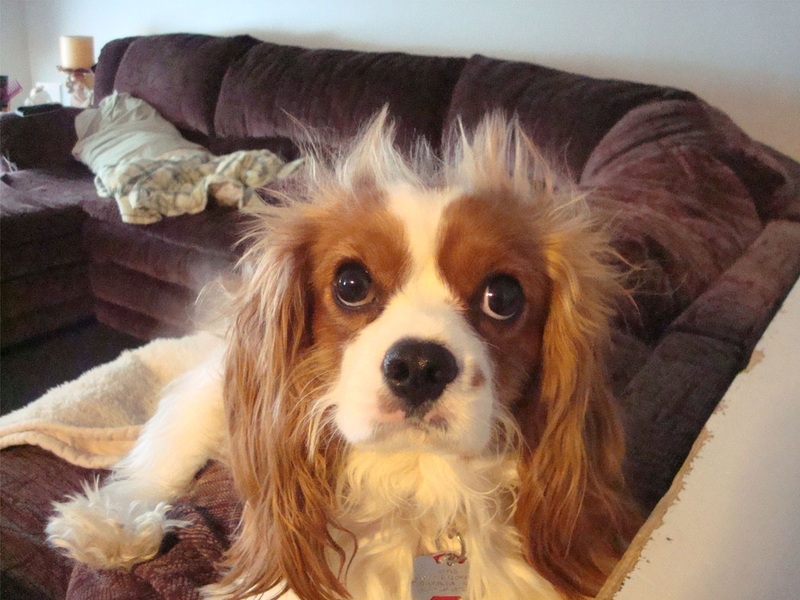 Cavalier's ears regularly. The only real difficulty is keeping white paws looking pristine instead of dingy. Others of us like the furry-footed hobbit look. you have a companion pet, rather than a show dog. they were born to have. or discharge. Your careful weekly exam will help you spot potential health problems early. 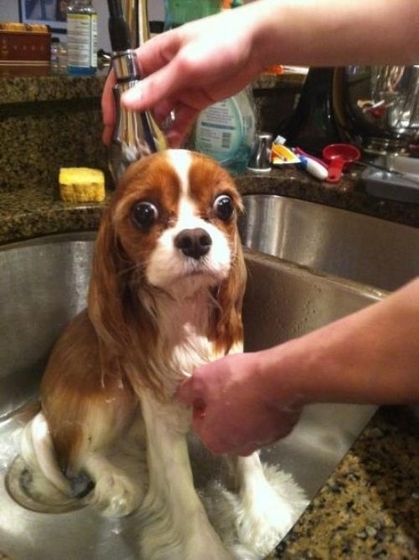 Cavaliers generally don't need bathing very often. sniff test, if they are stinky its time for a bath. of the year that is normally every 4-6 weeks. should NEVER be used on dogs. impossible to remove once wet. 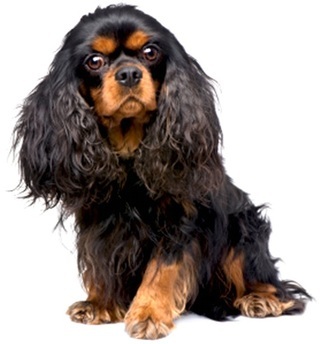 Since Cavalier King Charles Spaniels are small dogs, and their coats are traditionally never clipped, it's unnecessary to pay a professional groomer to give your Cavalier King Charles Spaniel a bath. 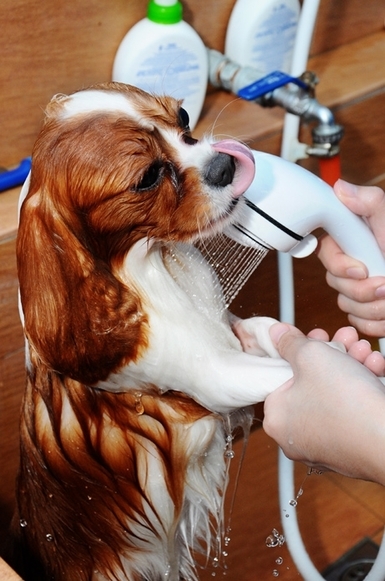 Follow these simple steps to give your dog a bath at home. have everything close at hand before you begin. some cotton balls, and a few tasty treats. so take time to help him adjust. 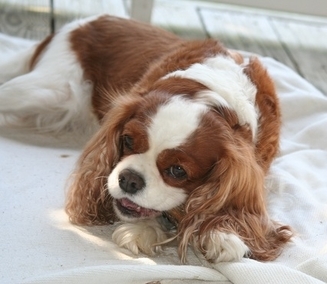 King Charles Spaniel becomes a happy participant, rather than becoming frightened or resistant. 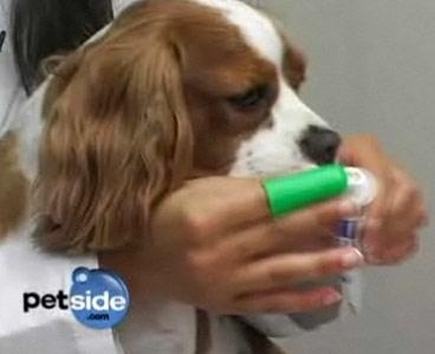 your dog's skin for any bites, scrapes, or irritations you may wish to bring to your vet's attention. you and fall from your kitchen counter to the floor. 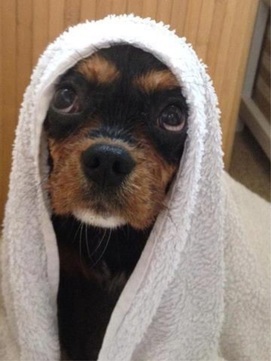 If your pet is too wiggly, bathe him in the bath tub instead. 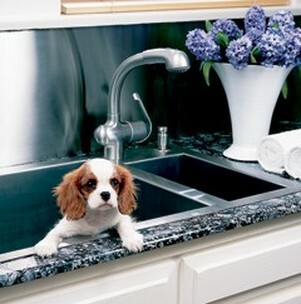 Cavalier King Charles Spaniel from slipping on the porcelain and will help him feel more at ease. Test the water temperature yourself before beginning to wet down his coat. If you are using the kitchen sink, the spray hose is a great convenience. 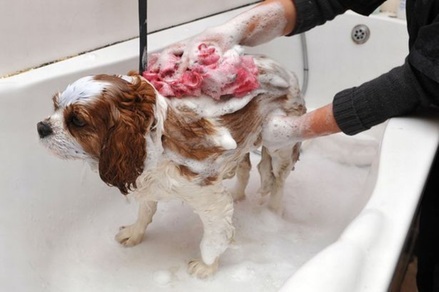 If you're bathing your Cavalier Spaniel in the bath tub, then you may want to use a plastic pitcher. 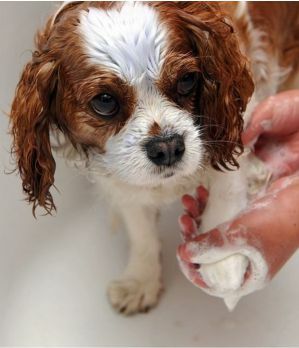 Rub in a shampoo specifically designed for dogs. right shampoo for your pet. the area around his eyes. 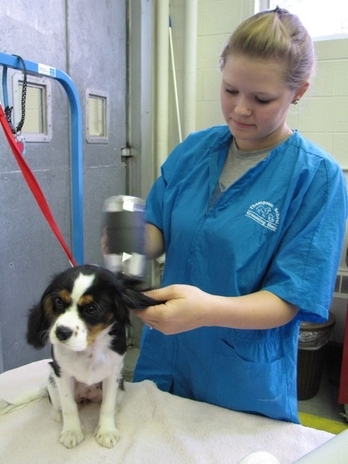 to blow-dry your Cavalier, use a low fan setting and cool temperature setting to avoid burning his skin. tool (Fur-minator) and nail clippers. "Fur-minator" (which is a life saver) shedding tool. get one of their favorite things........ food. 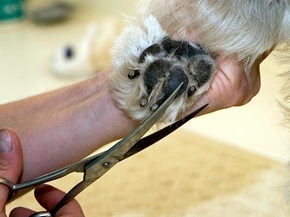 we clip nails we are always gentle with them and talk softly giving lots of kisses and praise as we clip them. Never lose patience with your puppy and if they get jumpy just gently hold them down (this also teaches them you are the alpha) while you clip each nail. likes when clipping their nails, our treat just happens to be a single cherrios. their reward. They are so focused on getting their treat they forget that they are getting their nails clipped. we know its only for the treats but hey whatever works right? to clip them. (Well easier then black nails). 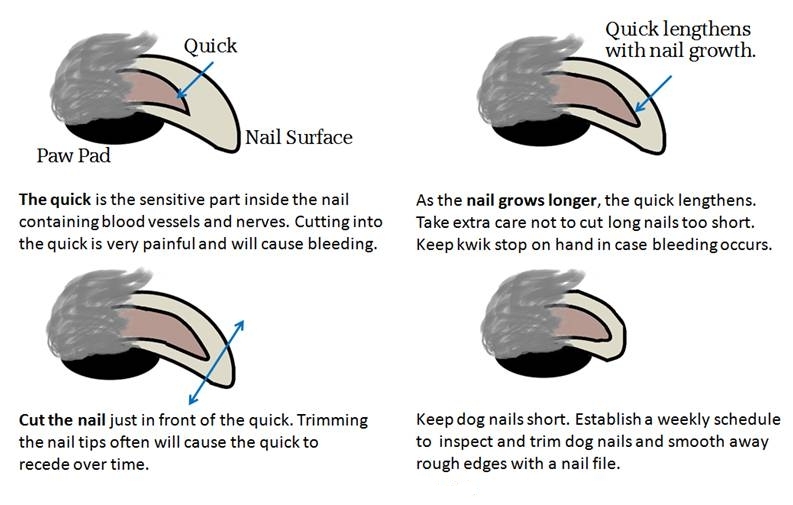 the nail which is called the quick. harder to know/see where it is. then clip a quick which makes your dog panic. 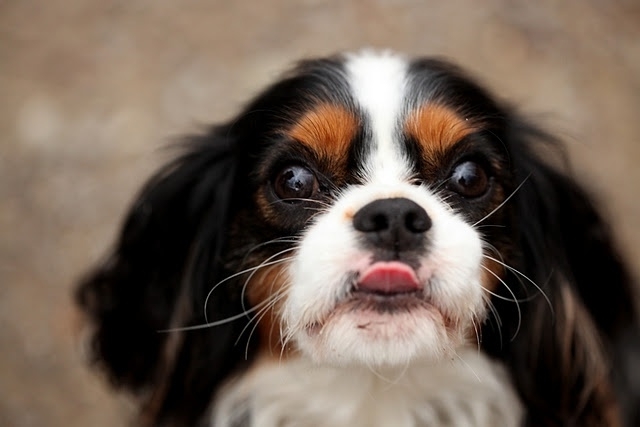 Cavalier enthusiastically jumps up to greet you. since their long, silky ears minimize air circulation and tend to trap moisture and dirt in their ear canal. 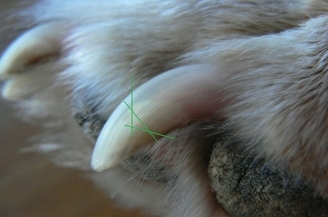 become itchy and bothersome to your pet, and ultimately painful and infected and stinky. ball or pad to wipe away the excess liquid and dirt. Repeat until the cotton ball comes away clean. Never use a q-tip or force anything too deep in your pet's ears. infections in other areas of the body. by their adult teeth at around 4 months old. you can do at home too. oven. We then freeze them to keep them fresh. given day we give each of them a bone to keep them busy and not wondering where we are off to. puppy will learn to let your brush their teeth. let you open his mouth for longer periods of time. and flavored toothpaste from your Vet or at your local pet store. 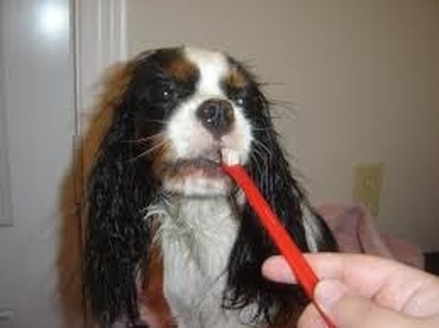 Ideally brush his teeth every other day. having his teeth cleaned gradually. used to the taste. With a dab of toothpaste on your finger, run your finger along the gum line, moving your finger as if it was a toothbrush. You may need to place your free hand on top of your dog's muzzle to hold his head steady as you insert your finger into his mouth. bristle pad on one side. 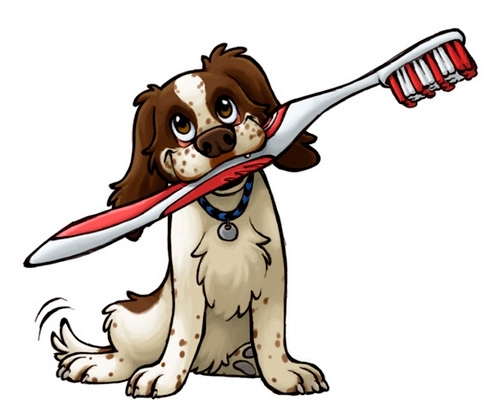 your pet's mouth and move along the teeth. 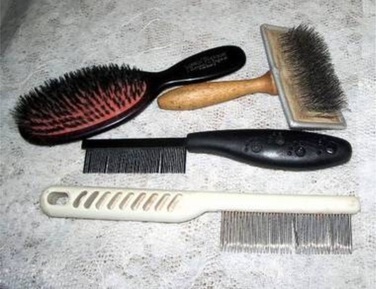 as long as it has soft bristles, or you can get a pet toothbrush from your Vet or local pet store. for you to slide the toothbrush into his mouth. become familiar with the process, move along the sides to the back teeth, eventually brushing the entire mouth. 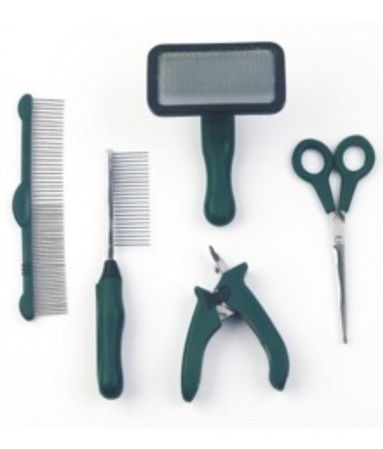 dental care has not adequately prevented tartar build up and gingivitis from forming. 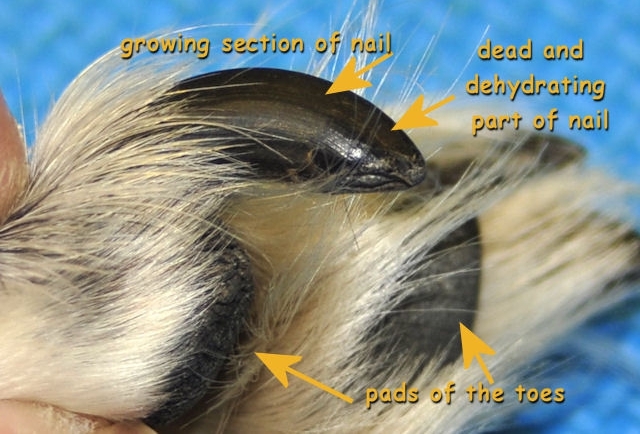 for easy veterinary exams and other handling when he's an adult.